There are as many variants on what the ”proper” way to re-string a guitar is, as there are guitarists. If you can’t get it right, don’t feel bad – you’re not alone. Many of us have tuning stability problems which can be traced back to the way we string our guitars. But there are also lots of people who get it ”right” (meaning that their guitars are stable), even though they use methods that ”shouldn’t” work. Some variants seem to be each other’s complete opposite, and it’s really all about finding a method that works for you and your guitars, and sticking to it. Here are a few tips and tricks that work for me. A string winder – I can’t imagine how I ever got along without this tool. It makes the previously so tedious winding up of strings a breeze, and it makes it much more easy to get the windings to sit neatly on the tuner post – which is essential for tuning stability. A tuning fork – you don’t have to have one of these, of course. You could use anything that provides a reference pitch. These days, I often use a tuning fork app on the iPhone, or onlinetuningfork.com if I’m in front of my computer. Why not a regular tuner, you may ask? I prefer not having to have the guitar plugged in, when all I want to do is make sure the guitar doesn’t go way out of pitch as I replace the strings. convenience – if you replace one string at a time, and stretch the new string until it is reasonably stable before attacking the next one, you will be done much quicker and will have a lot less trouble finding the right pitch. This is especially true for guitars with tremolo bridges, and essential for floating tremolos like the Floyd Rose. The general rule is therefore that you remove and replace the strings one at a time. Other than that, there are no real rules about it. On strats/teles with the ”open slot” vintage Kluson style tuners, I usually loosen the string enough so that it will come off the tuner when I pull up on the whole package. I then cut the string in the middle with the pliers – rather than try to force the curled-up part through the bridge. Do not cut the strings off while they are tensioned, though – the sudden movement can cause damage, both to the guitar (from the sudden change in string pull) and yourself (have you ever been hit by a G string that has snapped off…? Ouch.). On guitars with ”string-through” tuning posts, I loosen the string until it is flabby enough (remember the string winder? ), and then cut it off in the middle. Removing the string from the tuner without bloodshed is a little more work, but it can be done. With non-locking tuners, don’t wind on too little on the post. Obviously don’t wind on too much either… (more than will fit inside the thinner part of the post). Moderation is the key – I usually try to get at least 2 full turns on to the post for the low E string, and 4-5 turns on the plain strings. 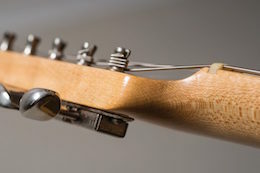 With Strats and Teles – the ones with only one string tree – the G string can sometimes rattle in the nut slot, due to the break angle across the nut being too flat. If you wind on enough slack (at least 5 turns) on to the post, the string will move downwards, creating a more acute break angle. Get a string winder – this little plastic thingy is absolutely invaluable, as it lets you wind the strings on quickly, while stretching them with your other hand. It helps loads in getting the strings to wrap neatly around the posts – which is essential for tuning stability. With floating tremolos, try to only replace one string at a time. If you have to take them all off – for instance to clean the fretboard or remove pickups/the pickguard – sticking something under the back of the bridge really helps get it back into its floating position, when the new strings are installed. Turn the tuner until the slot is oriented across the headstock (parallel to the nut). Feed the string through the tremolo block/bridge, and make sure you pick up all the slack, so the ball sits nicely as far into the block as it will go. 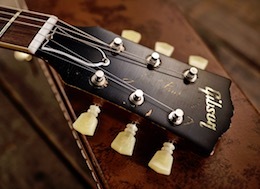 Grab the string with your right hand, and straighten it out (let it ”uncurl” itself) by sliding your hand along the string towards the headstock. When you reach the tuner, cut the string to length. This is partly down to string gauge (thinner strings need more length to produce the same amount of windings on the post, and the length of string each winding eats up is also shorter). For the low E, I usually cut the string somewhere between the D and G tuning posts – I want a fair amount of windings on the post, to get a good steep break angle over the nut. You need to figure out how much extra length you need, to produce the amount of windings you want. The tuners in the pic (which I’ve lifted from the web) has too few windings, in my opinion. Stick the string into the hole in the center of the slot, and bend it to the left (towards the tuning heads), letting it pass out through the slot. Then make a sharp right turn, stretching the string slightly, and you should end up with almost half a turn already done. Stretch the string to make it grab on to the post (again, viewed from the top, the string will now exit the slot and make a sharp right turn), while you turn the tuning peg. I usually grab the string with my right hand thumb and middle finger (to hold it stretched), and use the index finger to hold it down either against the fretboard/nut slot, or – for the thinner strings – against the face of the headstock. Keep the string stretched the whole time, so the windings coil up neatly on the post (instead of wandering all over the place). Tune the string to pitch, and stretch/tune it several times until it is reasonably stable, before you start removing the next string. Make sure the hole in the tuning post lines up with the direction of the strings. Feed the string through the tremolo block/bridge, and make sure you pick up all the slack. Grab the string with your right hand, and straighten it out (let it ”uncurl” itself) by sliding your hand along the string towards the headstock. When you reach the end of the string, feed it through the tuning post. Stop when you have enough string slack – I usually judge this by how high an arc the string makes, above the fretboard. You can also use the distance to the D/G-string post (as mentioned earlier) as a guide, before you feed the string through the post. When you have the correct amount of slack, grab the string with your thumb and middle finger, and turn the post so that the string bends where it exits the hole. You can help here, of course, to make it bend properly. Then use your index finger to keep the string down (for the right break angle), and wind it up. Keep the string stretched the whole time, so the windings coil up neatly on the post (instead of wandering all over the place). ”Over/Under” method: Same as the normal method, but when you wind the string up, let the unused part pass under the string the first time, and then over the rest of the time. This makes the string windings on the post ”sandwich” the string at the start of the wind, for a hopefully tighter fit, and more stable tuning. ”Locking” method: Again, the same method is used, but this time stop just before the peg has turned its first full turn (right before the unused part passes the string you’re winding up). Grab the unused part, bend it to the right and loop it clockwise around the string post. Pull it up on the left side of the string, and bend it straight up (if not even a bit to the right). Keep the string stretched, and turn the tuning peg so that the string you’re winding up passes over the part you just looped around and bent straight up. The idea is to lock the string at the start of the wind, again, to make the tuning more stable. Never, ever, remove more than one string at a time – getting the bridge back to the right position is a pain. If you need all strings off – for instance to change pickups or clean the fretboard – it’s often better to take the tremolo springs out and remove the whole bridge with the strings in place. You can also insert something under the back of the bridge, to stop it pulling back as you detune and remove the strings (this assumes the Floyd isn’t recessed). Make sure the guitar is tuned to pitch, and loosen the locking plate for the string pair you will be starting with, leaving the others locked. Remove the first string (I usually start with the low E) and reset its fine tuner – turn it all the way out, and back in a couple of turns. Stretch and tune/stretch/tune the string until it is reasonably stable. Replace the locking plate (but don’t tighten it down) as soon as you’re done with a string pair, and take care to replace it the same way (so any eventual grooves that has formed in it will line up properly). When you’ve replaced all six strings, stretched and retuned them, you can tighten the locking plates. I usually start with the high E/B string plate first. Re-tune the guitar once more (you will probably have to lower the low E string some, and raise the low A a little). 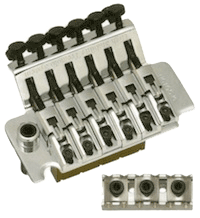 Basically, the key to keeping a Floyd Rose happy is to never surprise it by moving or shifting anything, or making any large changes. As mentioned, strings are best replaced one at a time. And I even make sure the locking plates go back the same way they came off, in the same position. If they don’t, you may end up with a string that won’t lock properly, since a rut that’s too deep for that particular string might have formed. If/when they develop ruts where the strings get clamped, just get a set of new ones.